We often get questions about if our real estate market is seasonal like our weather and our outdoor activities are. It is a good question, as the impression is that everything revolves around our ski season and our world class ski resort at Mammoth Mountain. And the assumption is that ski season is when buyers fall in love with Mammoth and wish to purchase real estate. It is true, ski season is when many people discover Mammoth and fall in love. But buyers looking for that perfect ski-in/ski-out condo do not always buy in the wintertime. They might need to get finances in order or have already mapped out their lodging for the rest of the ski season. Also, it is hard to get buyers inside to see listings because many of them are on rental programs and are occupied much of the season. Moreover, our market is subject to the macroeconomic conditions of our feeder market, Southern California, which is not seasonal. However, there actually is some seasonality to the inventory portion of our market. The graph above charts the number of condo + home + lot listings over time versus their Days On Market. Taking the difference between these two numbers (red line) shows a very regular rhythm to our inventory, looking like an EKG. Every summer, the red line peaks with an influx of new listings combined with their inherent low days on the market. Every winter, the red line takes a dive to a low point when inventory drops and the existing listings get stale. Why does inventory drop? We typically see a mini buying spree around Labor Day each year when the itch to ski returns and folks want to close escrow on a place before Thanksgiving. And some sellers take their condos off the market during winter to capture the seasonally higher rental income. In addition, single family homes and vacant lots are harder for buyers to assess when covered in snow, so they tend to fall off the market when the snow flies. And when the daffodils bloom again in spring, houses come back on the market, nightly rental income starts waning and sellers put their places back on the market. Winter: When inventory goes into hibernation, sellers could use this to their advantage when there is less competition, especially if they keep their property off a rental program so that it can be shown. Summer: Buyers can use the swell in inventory to their advantage to pick and choose among more options. All this being said, there is still plenty of real estate activity year-round in the Eastern Sierra as local families need to move, long-time homeowners sell off their vacation homes, and Mammoth Enthusiasts upgrade from a condo to a house. We are even seeing an uptick in second homeowners making the move to Mammoth full-time. So, while we wish there was a simple answer to ‘when is the best time to buy or sell in Mammoth?’, the best answer is to talk with us and we will assess current market conditions and match them with your specific family goals. The national cooling in the real estate market may be creeping into our local market as well. The current number of condos in escrow is 23, which is the lowest in 2½ years, down from a high of 61 in Sept 2017. For the past year and a half, sellers had been successful at pricing their condos ahead of the market and getting an average of 97.9% of their asking price. However, buyers are now being pickier and showing some price resistance, and we are seeing this number drop to 97.2% in the current quarter. For single family homes, the median sales price so far in 2018 of $939,500 is 21% higher than in 2017, but sales are slower (5.75 homes sold per month versus 7.4 per month last year). 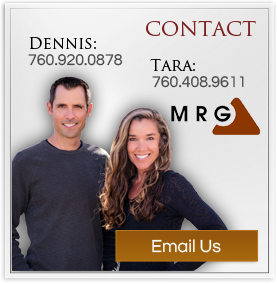 Tara and Dennis would love to help you sell your property. When choosing an agent, experience matters. We have been through several market cycles and are able to advise sellers on appropriate list prices, employ proven marketing strategies, help negotiate repairs, direct clients to reliable contractors and leverage our large database of buyers. This entry was posted in Real Estate Blog on November 16, 2018 by Dennis Cox.